This was Bill Withers' second album, and it was another beguiling mix of deep soul, acoustic folk, electric funk and observant, some times cutting lyrics. 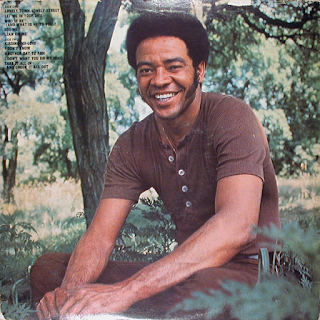 It is, like its predecessor, a unique album in the development of soul music. Withers really wasn't like anyone else at the time and his work justifies several listens. The album begins with two somewhat laid-back cuts - first the insistent but generally gentle groove of "Lonely Town, Lonely Street". Don't let the melody mislead you, though, this is quite an ascerbic song, lyrically; secondly, the tender, acoustic tones of "Let Me In Your Life". There are vague hints of Van Morrison on this song, for me, in its quiet, meaningful soul vibe and string orchestration. It is a lovely song, but an odd choice for second track in. Cuts like this often come half way through. Up next is a trio of absolute Withers classics - first up is the lyrically paranoid funk of the mysterious "Who Is He (And What Is He To You? )", which is just such a wonderful, evocative song. I have always wondered about the derivation of the word "dadgummit", however! Then we get the peerless, intoxicating, organ-driven funk of "Use Me" followed by the uplifting, gospel soul of "Lean On Me". The former has been covered by Mick Jagger and Grace Jones, the latter taken to number one in the UK in 1976 by Mud. Both of them are superb songs. I remember first hearing "Lean On Me" in 1972 as a fourteen year-old and being blown away by it. Every time I hear it now it takes by right back. It was also memorably and movingly performed in the movie of the same name from 1989. "Kissing My Love" begins with some irresistible drum and guitar funk and proceeds into an upbeat groove with a great soul vocal from Withers. It almost has a jazzy feel at times too. "I Don't Know" slows down the pace with a gloriously atmospheric slow burner that features some excellent George Benson-style jazz guitar. "Another Day To Run" returns to funk with another supremely infectious number. The percussion and bass interplay on this is sublime. It is often forgotten how funky Withers could be. Here is the audible, cookin' proof. It is also lyrically tough, in that Withers is singing to a friend caught up in drug abuse. The funk continues on the wah-wah and fatback drums of the bluesy "I Don't Want You On My Mind". "Take It All In And Check It Out" is also seductively addictive. More sublime wah-wah licks abound. A quality end to a quality album. At the same time there was Marvin Gaye, there was Al Green, there was Curtis Mayfield, there was The Temptations, there was The Undisputed Truth, there was Stevie Wonder. 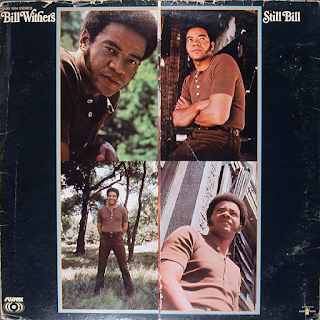 There was also Bill Withers, something that should never be overlooked when assessing great early seventies soul.